The Delta Flight Museum is located on the campus of Delta's World Headquarters, in Historic Hangars One and Two. The entrance to the Museum is located off of Woolman Place, next to the Boeing 757. The headquarters, built in the 1940s, are the oldest surviving buildings of the Atlanta airport and were designated a Historic Aerospace Site in 2011. 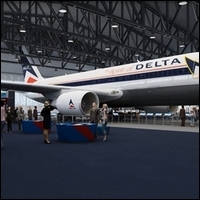 The Museum is a 68,000-square-foot, state-of-the-art facility where visitors can explore aviation history, celebrate the story and people of Delta and discover the future of flight. Parking: The entrance to the Museum is at the Delta Air Lines East Gate, near the Boeing 757. The guard at the security gate will provide parking instructions.